This Spring, the NATT Museum committee has borrowed some artefacts from the Cheriton Archives to be shown in their display cabinet in the Alresford Library. 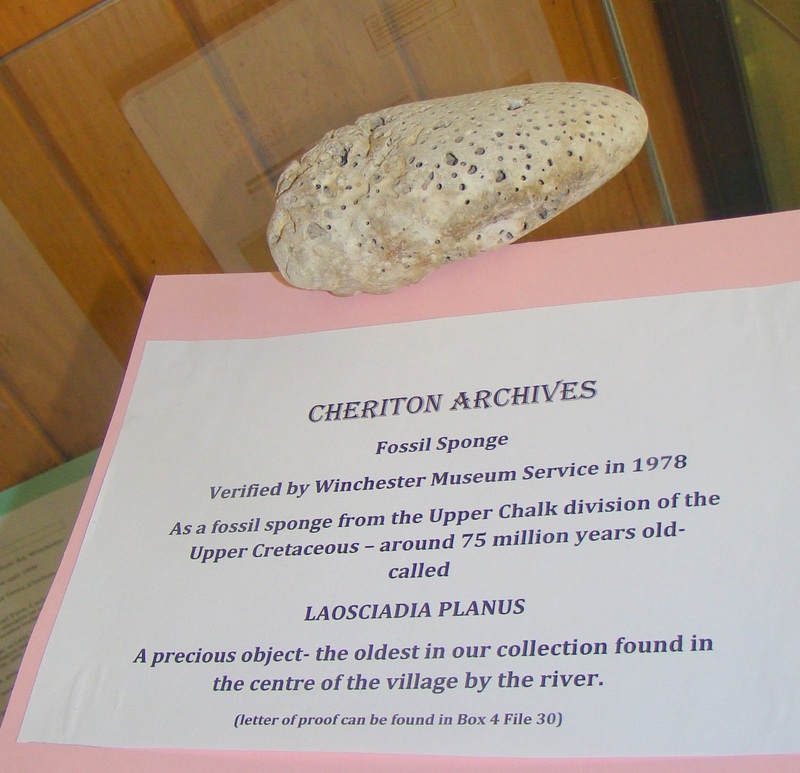 Pat Culpin, the Archivist, has been collecting documents and actual historical objects relating to the Parish of Cheriton for many years, and organises occasional displays of these items for the public. After one such display in January, several of the objects were selected for loan for this Alresford display, to possibly reach a wider audience. The flints in the chalk in this area of Hampshire have interested the people and have been adapted for use since the Stone Age – which lasted over 3 million years! It ended somewhere between 2000 and 6000 BC. But in all those years many of the tools created from flints were lost or thrown away, and are still around to be found. 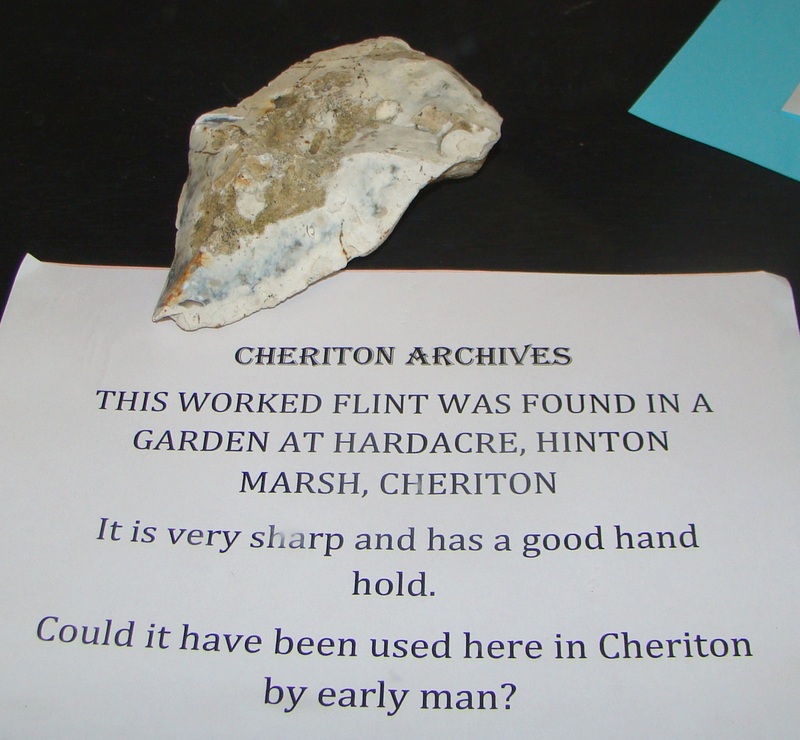 Several found in Cheriton, often exposed by farmers or in the stream, are shown in the library display. 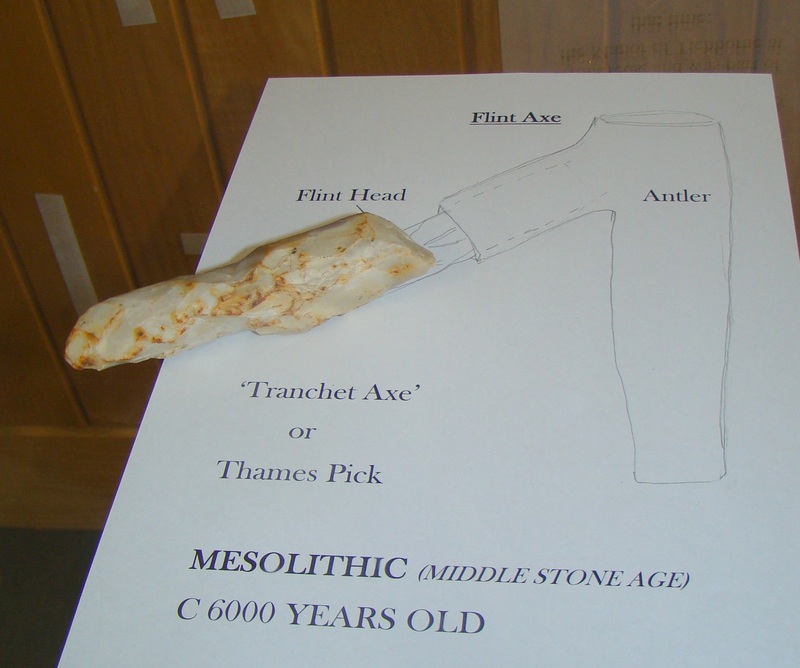 First is a Flint Axe – also known as a Tranchet Axe or Thames Pick. 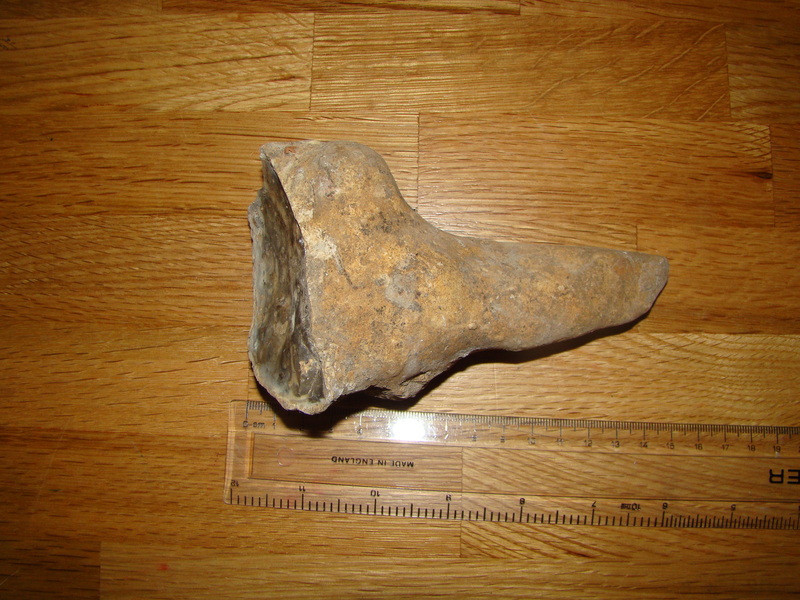 This flint would have been attached typically to a deer’s antler, which acted as the handle, and angled the flint to enable it to be used efficiently. 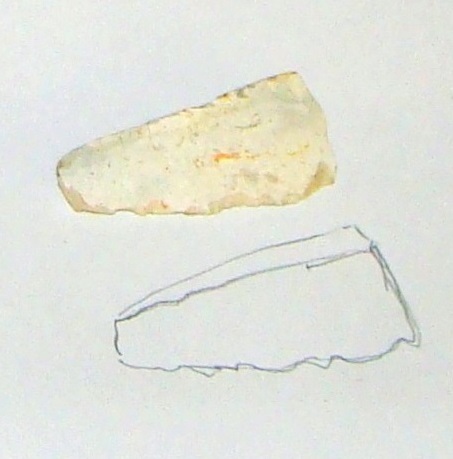 The second flint is sharpened to form a small knife blade: another worked flint also has a sharp edge. A slightly different flint is perhaps typical of the fascination these objects have: this one is in the shape of a horse’s hoof. Many other flints, known as shark’s teeth, are found in the chalk, but they have nothing to do with sharks, or teeth! Cheriton is also famous for the battle between the Royalists and the Roundheads in the English Civil War, which was fought in the fields near Cheriton. Sir William Waller and the Parliamentary troops won the battle, and the Royalists retreated, through Alresford. A cannon ball is shown in the display that was found at the probable site of the battle. Other items include old household items as used early in the last Century, or earlier, such as flat irons, scales, a foot warmer and a paraffin lamp. The display cabinet also contains the three Alresford maces used by the Bailiff and Burgesses, who pre-date the New Alresford Town Trustees, originating in 1572. In the housing estates around Alresford it is common to dig up many flints from the chalk, which is often only a few inches below the surface of the soil. While many of these look like pointed teeth, they are typically around an inch (2.5cms) long. Having found a specimen that was a magnificent 6 inches long, picture below, I decided to ask the Sedgwick Museum of Earth Sciences, in Cambridge, about these “teeth”, since Ken McNamara there had just discovered a new genus of shark, now named after him, based on finding a six inch long fossilised tooth. “Unfortunately I don’t think that your specimen is a shark’s tooth. You are correct in that flint sometimes forms moulds or casts of fossils, but these are usually oyster shells or sea urchin tests made from calcium carbonate; a relatively soft material that is readily dissolved away or replaced. Teeth are made from calcium phosphate, which is much more resistant to chemical dissolution. I’ve never heard of a tooth being replaced. Your specimen is most likely a burrow infill. Burrows are often long or pointy with branches or nodes, so it is not surprising that they get mistaken for bones and teeth. Burrow in-fills are very common, and found widely in Southern England. The next most common fossil preserved in flint is sponges. Many Cretaceous sponges are mushroom-shaped, cup-shaped or conical. So this is another possibility.